On Wednesday, September 16th American Security Project hosted a conference on ‘Cyber Security: Risk, Recovery, and Resilience’. 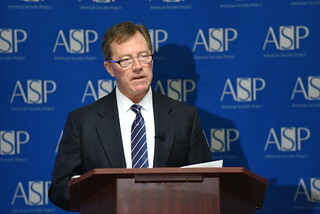 After opening remarks by ASP CEO BGen. Stephen Cheney USMC, (Ret.) – in which he mainly focused on the diversity of the concept of cyber and the challenges this may create to national security, RDML Danelle Barrett – Deputy Director of Current Operations at USCYBERCOM – to delivered the keynote address. Admiral Barrett first focused on the differences in the physical domain as compared to the ‘new’ cyber domain. She then went on to underline that the US military is more than aware of possible threats coming out of the cyber domain, point to figures showing that over the last year, over a hundred state and non-state actors have actively tried to direct a cyber-attack against US DoD systems. One of the reasons these attacks are so numerous are because of the low cost of entry, leading to ‘college whiz kid hackers’. Whereas these individual hackers might be unable to severely damage US critical infrastructure, defending against such attacks is very expensive and time-consuming. The presentation focused on three intensity levels of potential cyber-attacks. According to USCYBERCOM guidelines, an attack in the cyber domain can be rated exploitive, disruptive or destructive. In the recent history we have ample examples of attacks falling in each of these categories. The operational approach of USCYBERCOM is aiming to secure that DoD can successfully accomplish its mission and goals. It does so using its ‘strategic roadmap’, in which they focus on five areas that need to be developed in order to establish a USCYBERCOM that is ready for the future.